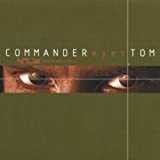 Commander Tom (real name Tom Weyer) is a German DJ and music producer. He began working as a DJ at the "Drops SuperDisco" in Kehl in the 1980s, and also worked as a DJ at the "Rheinpark" discothèque in Germersheim in the 1990s. In 2004, his single "Attention! ", sampled from the Tom Novy vs. Eniac 1997 song "Superstar", hit #1 on the German dance music charts. It peaked at #23 in the UK Singles Chart in February 2005. His most recent single "I Can't Sleep!" was released in 2006.